This lab manual does not include a MOAC Labs Online access code. 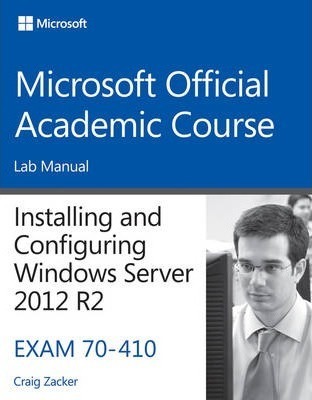 This is the companion print lab manual to the 70-410 Installing and Configuring Windows Server 2012 textbook. The 70-410 Installing and Configuring Windows Server 2012 textbook prepares certification students for the first of a series of three exams which validate the skills and knowledge necessary to implement a core Windows Server 2012 Infrastructure into an existing enterprise environment. This Microsoft Official Academic Course is mapped to the 70-410 Installing and Configuring Windows Server 2012 exam skills and includes the recent R2 objectives. This textbook focuses on real skills for real jobs and prepares students to prove mastery of core services such as Active Directory and networking services. In addition, this book also covers such valuable skills as: Managing Active Directory Domain Services Objects Automating Active Directory Domain Services Administration Implementing Local Storage Implementing File and Print Services Implementing Group Policy Implementing Server Virtualization with Hyper-V The MOAC IT Professional series is the Official from Microsoft, turn-key Workforce training program that leads to professional certification and was authored for college instructors and college students. MOAC gets instructors ready to teach and students ready for work by delivering essential resources in 5 key areas: Instructor readiness, student software, student assessment, instruction resources, and learning validation. With the Microsoft Official Academic course program, you are getting instructional support from Microsoft; materials that are accurate and make course delivery easy. Request your sample materials today. The Microsoft Official Academic Course (MOAC) Program is the official product for Microsoft Programs in higher education. These learning products are created especially for the academic market and combine the business world focus and market research of Microsoft with 200 years of successful higher education publishing from Wiley. The program is based upon the same curriculum as the Microsoft IT Certifications to build the skills students need to succeed at work and the preparation they need to validate those skills and get the jobs they seek. All the support instructors need to deliver great courses on Microsoft software is in the program. Student copies of the textbooks include the trial software in select markets and student files for completing homework assignments. Microsoft Updates will bring you the latest information on new products and curriculums and are a part of the program. MOAC is a great way for instructors to get ready to teach and for students to get ready for work.